The next animation depicts the chemical reaction HCl + O -> Cl + HO as computed by Quasi-Classical Trajectory (QCT) calculations. The computations were done by Bala Ramachandran at Louisiana Tech University. This animation was produced by J. David Adcock, a graduate student in Prof. Wyatt's research group. The graphics were rendered using the POV Ray Version 3.0.1 program. In the animation, the yellow sphere represents the hydrogen atom, and green sphere represents the chlorine atom, and the blue sphere represents the oxygen atom. In order to highlight the trajectory of the atoms, the preceding 200 locations of the center of each atom are shown by a track which has the same color as the atom. 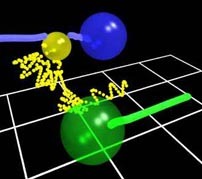 For the slower-moving chlorine and oxygen atoms, this track becomes a solid "tail", while the rapidly moving hydrogen atom is followed by a trail of spheres at the preceding atom center locations. The initial vibrational motion of the hydrogen atom with respect to the chlorine atom is shown to scale. Upon entering the reaction complex, the motion of the hydrogen atom is strongly influenced by the large electrostatic forces, and the entire complex can almost be considered an unstable triatomic molecule. Note how the track of the oxygen atom is also perturbed in this encounter. One of the principal areas of interest in this system is how the vibrational energy of the reactants is transferred into rotational energy in the products, and this model provides one explanation for this phenomenon. For more information, send e-mail to david@quantum.cm.utexas.edu.